At the very moment Invincible’s shooting is at her best, she falls victim to another magazine explosion. Invincble went to the rescue of the Chester, one of her scout cruisers, which had been chased by four enemy cruisers (the Frankfurt, Pillau, Elbing and Wiesbaden) and had taken heavy casualties. At 17:53 Invincible’s 12-inch guns opened fire at 8,000 yards. 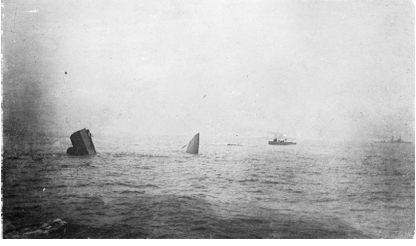 The Wiesbaden, last ship in the line, was hit as she turned to run: one of the Invincible’s massive shells had burst through the side in the engine room bringing her to a stop. A half hour later Invincible had – after having steering problems – joined up with Beatty’s line and roughly 9,000 yards distance from Hipper’s battle-cruisers. 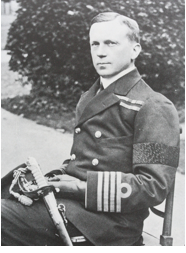 At 18:26 she was heavily engagd with the Lützow and causing heavy damage so much so that Rear Admiral Horace Hood encouraged his gunner officer, Herbert Danreuther (a godson of Richard Wagner) saying “Your firing is very good. Keep at it as quickly as you can. Every shot is telling”. Minutes later, the fog back that had been protecting parted and the ship was lit up by the sunlight which fell trough. At 18:31 Lützow now landed a shell that penetrated Q turret and set her magazines on fire. The explosion was like a small nuclear mushroom cloud. HMS Invincible seen astern of one of her sister ships at Jutland. Passing ships were confused. They had not seen what had happened and at first cheered, thinking it was a German ship. HMS Invincible broken into two parts, bow and stern, with the destroyer HMS Badger picking up survivors. Squadron flew his flag from HMS Invincible. When the surviving ships came back to Rosyth, Hood’s family were gathered and eagerly awaiting the father of the family. They had not heard the news. It must have been crushing. 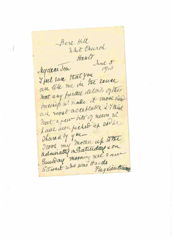 Lady Hood wrote a number of letters to re-assure those with husbands who had not returned of their last moments. One such letter concerned Charles Overy in a letter to the Dorking and Leatherhead Advertiser, on January 27th 1917. Below is a letter from Oldric Portal, whose younger brother, Raymond, died on Invincible. It is written to his friend Tom Fisher who also lost his brother – Charles – on Invincible. Report from Oldric , HMS Invincible, giving a clear summary of the sequence of events before Invincible exploded (Kindly submitted by Deborah Curle, the great-niece of Charles Fisher, seen below, was serving on HMS Invincible.). Charles Fisher, HMS Invincible. 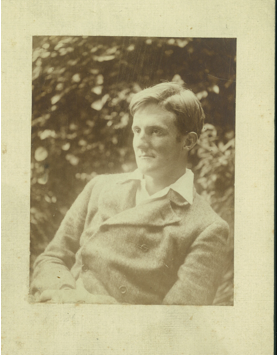 His sister, Adeline, was Vaughan Williams’ first wife, who apparently never recovered from his loss. It gives the Jutland Concert which took place on June 15th 2016 at the Barbican Center, some closer connections with the battle than one might at first imagine. 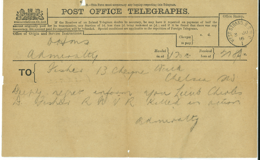 The telegram that went to inform next of kin of a death in action was Curt beyond belief.